‘I was supposed to know the plot but all I knew was what I saw: flash pictures in variable sequence, images with no meaning beyond their temporary arrangement’. I’ve recently become obsessed with this (abbreviated) Joan Didion quote which, in her case, referred to an instance of writer’s block over a film script. However, it’s also an apposite analogy for working in our modern communication environment in general, and crisis communications in particular. This rang especially true for me last week when I was in Estonia for workshops with the country’s police spokespeople on techniques for interviews with international journalists. As you can imagine, the police’s default mode is crisis management so they’re well positioned to deal with their fair share of ‘flash pictures’ and ‘images’ that don’t tell a coherent story. So, how can organisations give the impression of control during a crisis? Unsurprisingly much of it is to do with choice of words, something Didion herself would probably recognise. The strategic use of language and information are instrumental for creating a sense of order, particularly during an emergency. And what’s interesting here is that regardless of mother tongue or organisational type, (good) spokespeople often reach for the same kinds of words in an emergency. And, lest you think this is an argument for organisations to cynically project control where there is none, that is why I have used the word ‘impression’ rather than ‘illusion’. It is a well-known tenet of crisis communications that an organisation’s perceived ability to handle a crisis both during and after an event is key to the successful resolution of the emergency, as well as the protection of the organisation’s reputation. 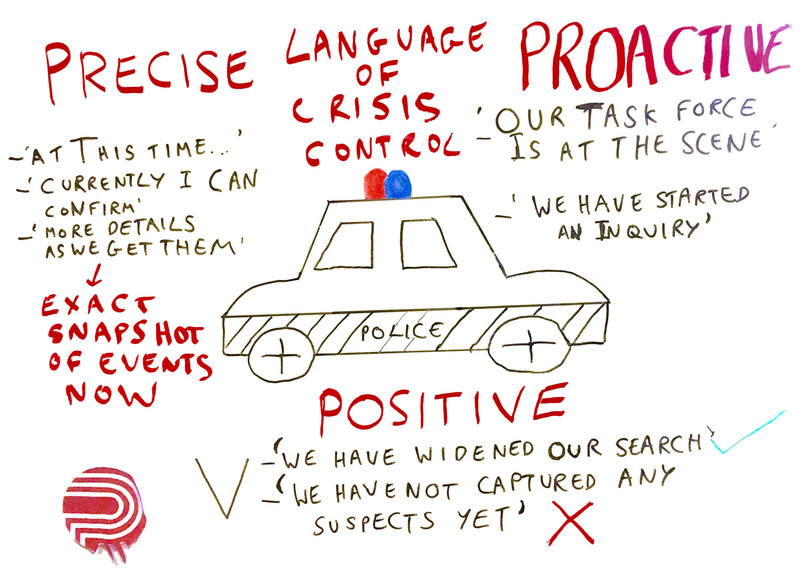 So, whether you are a CEO of a large manufacturing company, a senior manager at an EU institution, or a humanitarian agency, the scribble above contains some of my observations about use of crisis language that may ring true for you and other communicators. (Ps the three Ps were not planned but on reflection I think they work quite well as a guiding principle: the PPPs of language and crisis control).